Science presenter and writer with a background in evolution and animal behaviour. Ant colonies are one of the wonders of nature - complex, organised and mysterious. This programme reveals the secret, underground world of the ant colony in a way that's never been seen before. At its heart is a massive, full-scale ant nest, specially designed and built to allow cameras to see its inner workings. The nest is a new home for a million-strong colony of leafcutter ants from Trinidad. Science Showoff at the Star of Kings. I talked about the evolution of altruism, slime moulds and why everyone isn't a jerk. NewsTalk Interview - Should we let wildfires burn? Live performances for Science Showoff, Agony Auncles of Science, The Variables Present, the Ugly Animal Preservation Society and BrightClub. 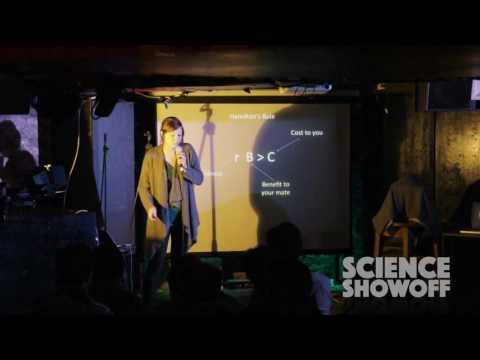 7th October 2017: Science Showoff (The Star of Kings, Islington). 12th October 2017: Science Showoff (The Spread Eagle, Croydon). 10th August 2017: Science Showoff (The Spread Eagle, London). 23rd May 2017 - The Variables Present: An Evening of Science Variety (The Portland Arms, Cambridge). October 26th 2016: Smashed Science Youtube video with Florence Schechter. October 21st 2016: Panel Speaker on Mediums of Science Communication, BSA SciComm Primer.